In this post, I discuss a pre-focusing strategy I used in capturing the image above. I submitted this image to my PSA (Photographic Society of American) nature study group. Each month I submit an image to be critiqued by the other members of the group as well as the group moderator. In turn, I critique the other members’ monthly image submissions. With each monthly image submitted, the makers include information on how the image was made and what factors went into creating the image. 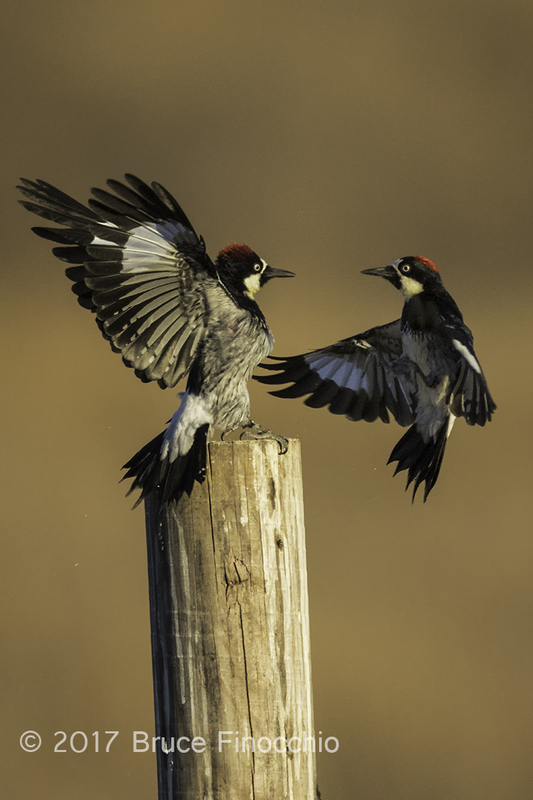 I thought that my website followers would also benefit in learning how I used a pre-focusing technique in creating this image of two Acorn Woodpeckers facing off over a post perch. Going into details of the creative process and explaining the goal when I came faced with this particular nature setting and situation. Goal: My goal was to capture Acorn Woodpecker behavior. While hiking at the Stanford Dish trail, I noticed several Acorn Woodpecker granary trees and groups of Acorn Woodpecker flying around. The next time I went there I brought my cart with my 600 mm lens to try to photograph them as the trailhead was a fair bit away. Too far to lug my tripod and camera over my shoulder as I used to do in my younger days. Unfortunately, these trees granary trees were very tall, and there were several of them. If I staked out one of them, the acorn woodpecker would favor the other trees. Even though, I am normally a very patience person; it one of my best personality traits. I felt frustrated and thought this is not working well photographically. While waiting I thought, maybe, I should bring my portable blind next time, and other thoughts of camouflage ran through my mind. I was next to the hiking and running trail, so people would look at my large lens and some would comment how big it was, a typical remark. What was I doing questions came to me from some of the passersby too. Once particular observant walker told me that the Acorn Woodpeckers were lining up on a fence just up the trail. He said there was a water trough just on the other side of the fence. Immediately, I got excited about the prospects of getting some good behavioral images. Technique: As I canvased the area and the situation, I realized that the Acorn Woodpeckers would land on the fence line before head down to the water trough behind the fence to drink. The light was behind me, setting in the west, throwing its beautiful late evening light on the woodpeckers. My technique was to pre-focus on these fence post-landing areas. There were the traditional metal posts and a couple of telephone-type posts used for perches. I preferred the telephone post, as one was strategically placed right in front of the water trough. The water trough was away from trees in the middle of a grassy field. The only trees were right and left of the water trough but at least thirty to forty yards away. I noticed that the woodpeckers would stage in the trees and then fly out to the posts, land, and then fly down to the water trough. Therefore, I could see them coming into this particular post. It seemed to be favored by them. I pull out my remote cord from my camera vest and would fire a bunch of images off when I could see that they were heading to this particular telephone pole perch. I would not even look through my lens as I fire off a burst. Many of the images were blank, as I started this series before they came into my lens view. Occasionally, they would bypass this particular post I was pre-focused on, and I would get nothing. Also, sometimes, I would be late with my sequence, and the Acorn Woodpecker would already be perched on the post or caught half out of the image. This wasn’t all bad, for it seemed like a territorial issue for them because they would sweep by and try to chase or bluff off the one already occupying the perch. Using this technique, finally, I got some captures of the conflict. This particular one showed the dramatic engagement of one swooping in on the one trying to defend his perch position. This was the decisive moment as their eye contacted and wing positions strengthen the story of their behavior. Yes, the telephone pole perched shows the hand of man, but in this case, the Acorn Woodpeckers use this perch and have incorporated into their natural behavior. Processing: In order increase my chances to capture their behavior, I was pretty far back and the woodpeckers were pretty small in the frame. This helped with the depth of field, but lessen the impact of the woodpeckers themselves. I cropped more than usual. Then, I upscaled the image in Photoshop back to the original size, and then, made my small web jpeg files from the upsized image. The frontal lightning was so good, and because I used a tripod with a remote cord. My original capture file was sharp, clean, with lots of detail. I didn’t lose much detail or sharpness with this upscale. I also think that my fast shutter speed of 1/3200 sec really helped freeze the blink of an eye action. I lighten the underwing on the approaching Acorn Woodpecker a bit with Viveza. I also intentionally chose a non-sky background, a non-distracting brown field rather than the blue sky. Equipment/Source: Canon 7D Mark II body, EF600mm f4.0 lens with a 1.4 teleconverter III, 1/3200 sec at f7.1, ISO 1000, Aperture Priority, Pattern Metering. Here is my response to the moderators and other group members’ critiques. One consistent comment was about the composition and the extra space above and below the Acorn Woodpeckers. The moderator pointed out that the one side of the post was a bit bright, and drawing the viewers’ focus to it and away from the subject. Afterward, I revised my image based on their comments. I think I improved the visual impact and overall aesthetics of the image. What do you think? 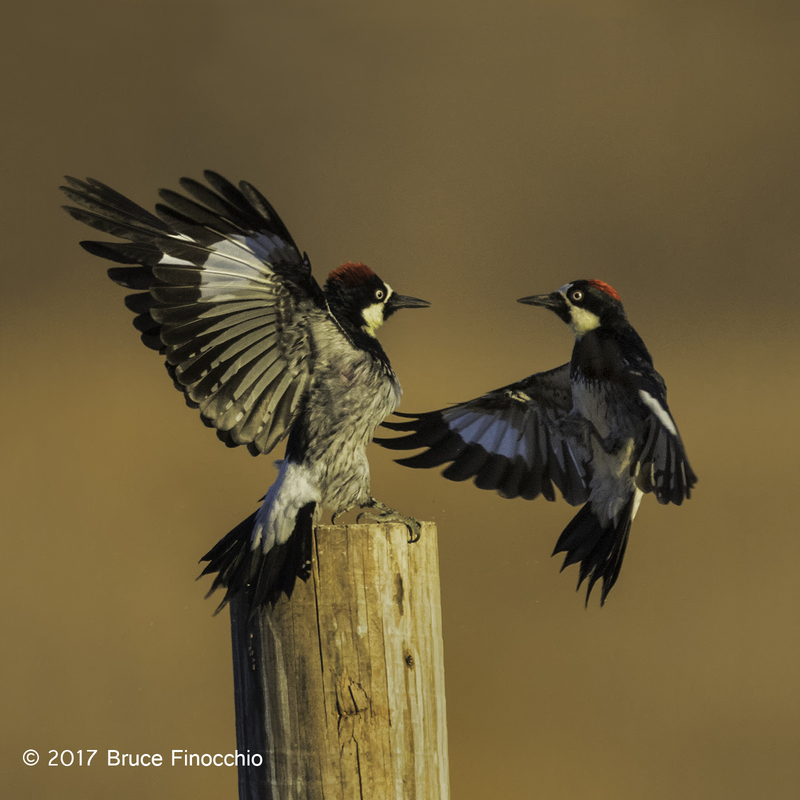 Thank you for your comments on my December image of the “Two Acorn Woodpeckers Fighting Over A Perch”. I agree with your suggestion to darken the right side of the post perch. I am surprised I did not see this; I am usually very perceptive in seeing lighter areas that draw the eye. I cropped the original capture quite a bit, that’s why I was reluctant to even reduce the image file further in order to make the birds larger in the frame. At the time of processing, I was a little uncomfortable with the composition, yet I didn’t see a better one. Sometimes I get tied to the 2 x 3 format too much. Therefore, I went back and took Fran’s suggestion and made a square format for the capture, and also darken the right side of the post. I think these changes improve composition and the overall impact. To Butch’s comment and question about the focus wandering, I primarily used AF focus and sometimes will tweak it manually. The second time I was there when I took this image I did bring my cable release. Thus, I did pre-focus on the top of the pole and wasn’t even looking through my lens. I was tracking the birds with my eye, starting my burst when the one Woodpecker was little ways away in its flight to the post. I have found this technique works well with a repeatable landing spot. Also, I use rear button focus practically all the time unless the situation specifically calls for shutter button focus. This separates the shooting function from the focusing function and means I can focus on the eye of the bird, and then recompose for composition. Whereas with shutter button focusing when the bird changes position quickly it’s much harder to get the focus correct. The tendency also with focus button focusing is to have center subject compositions, rather than creating more dynamic off-centered subjects. Especially with bird photography, off-center subject placement so much easier with rear button focusing. Hi Bruce, Lovely image and moment caught just right. Thank you for sharing! It is an interesting article and very difficult for me to evaluate as the image is too small. That said, it just feels that the acorn on the left is not sharp enough (aka either lack of DOF, or bad position of the bird). I do like the suggested crop much better. To improve the composition, would like to see a diagonal line between the two acorns (vs. straight as is). Love the background. Worth trying again and again to improve this shot. Oliver.